AS FEATURED IN THE HBO DOCUMENTARY THE NEWSPAPERMAN: THE LIFE AND TIMES OF BEN BRADLEE! An eyewitness account from the playing fields where the first rough draft of history was written. On August 8, 1942, I graduated from Harvard by the skin of my teeth at 10 a.m. At noon, I was commissioned an ensign in the U.S. Naval Reserve. And at 4 p.m., I married Jean Saltonstall, the first and only girl I had ever been with and I was on my way to someplace called the South Pacific. I was not yet 21...The education of Benjamin C. Bradlee was finally under way. And so begins this witty, candid story of a daring young man who made his way to the heights of American journalism and public life, from a New Hampshire weekly through his foreign correspondent years in Europe, to the apex of his career at The Washington Post, whose Watergate coverage gave journalism its finest hours. An eyewitness to most of the seminal events of our time, a good friend to President Kennedy and a dreaded foe of President Nixon, Bradlee watched and talked to most of the heroes and villains who were making such vivid history so fast. Taking the helm of The Washington Post in 1965, Bradlee and his reporters redefined the way the news is reported, published, and read; his leadership and investigative drive following the break-in at the Democratic National Committee led to the downfall of a president, and kept every president afterwards on his toes. 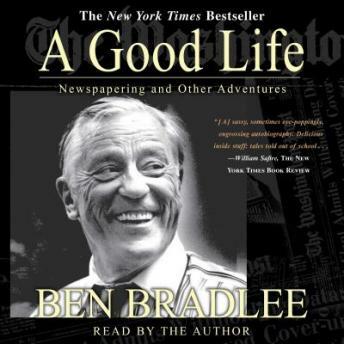 A Good Life is Bradlee's irreverent, earthy, and revealing look at modern American journalism -- and the extraordinary life story of the man who helped to reinvent it.